Another candidate has put her name forward for the leadership of the Scottish National Party. Nicola Sturgeon follows Roseanna Cunningham, who announced she was standing on the day John Swinney said he was stepping down from the post. Ms Sturgeon, a Glasgow list MSP, said she would bring a "new style of leadership" if elected. She told the BBC she was "best mates" with Roseanna Cunningham and hoped to remain so after the contest was over. 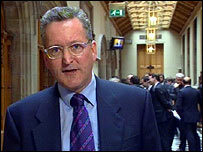 Fergus Ewing, the SNP's finance spokesman, has put his name forward for the deputy leadership of the party. Mr Ewing, who had been touted as a possible leadership candidate, make the announcement on Thursday. The deputy's position became vacant after Ms Cunningham declared her intention to stand as leader. The contest will be decided on a one-member-one-vote basis. Nominations close on 16 July and the result will be announced on Friday 3 September. Ms Sturgeon told BBC Scotland's Holyrood Live programme: "I was privileged to work with John Swinney for four years, but it is time for a fresh start and to stop the sniping going on in the sidelines. "I believe that if we want to start tackling poverty we need the full powers of independence to do that. "I will lay out my policies as the campaign progresses. But we need to re-establish this party as the party of social democracy, we need to tackle social inequality - that is at the heart of what I believe." She would not be drawn on whether she backed using the tax-varying power of the "penny for Scotland", but she said she would not rule anything out at this stage. The programme's presenter, Iain Macwhirter, referred to her public image and asked if she agreed with the view that she was a "nippy sweetie". She replied: "You know Ian from personal experience that is not true. "What I am is someone who is passionate about independence, someone who is passionate about politics because politics is how to change people's lives for the better. "I look forward to a contest which will strengthen the SNP and the independence cause." 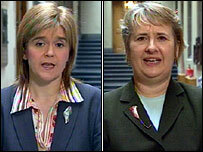 Of her opponent, Roseanna Cunningham, Ms Sturgeon said: "Roseanna and I are the best of mates and we hope to be the best of mates after the contest. "We will have a positive exchange of views over the next few weeks and I offer a fresh start, a new generation of leadership. "Fourteen years ago another person entered the leadership race as an underdog, his name was Alex Salmond and I will aim to emulate his success this time."